'Phytoremediation' is the cleanup or control of wastes, especially hazardous wastes, using green plants. There are many types of phytoremediation, as shown in Table 1 , including the use of phreatophytes to control plumes of groundwater contaminants and contaminated vadose zones. Photoautotrophs, including vascular plants, green algae, cyanobacteria, and fungi, must be involved in the synthesis or maintenance of biomass, or in the direct metabolism, storage, detoxification, or control of contami nants. Glycosylation, occurring in plants and saprophytic fungi but not bacteria, is usually important in direct metabolism, detoxification, and accumulation or storage of pollutants by plants. Glycosylation is a sequestration of contaminant molecules by the addition of a glycosyl group to form a glycoprotein that plant cells can easily transport and store or transform. Not all applications of phytoremediation involve glycoproteins but the occur rence of glycosylation in pollutant transformations does distinguish whether the metabolism of organic con taminants or transformation of other contaminants is bioremediation or phytoremediation. • selectively favoring specialized microorganisms that degrade or accumulate contaminants by pumping oxy gen into the root zone, releasing exudates, or depositing secondary metabolites during root die back in the rhizosphere to favor aerobic, facultative, or anaerobic organisms with enzymatic activity for the secondary products released or deposited; and • transporting pollutants into active microbial zones by evapotranspiration, blockage of flows, or other means. 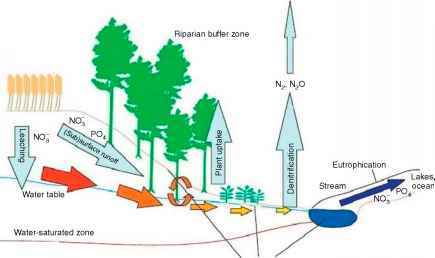 These processes are a vital part of phytoremediation. Depending on the various interactions of photoautrophs and heterotrophic microbial communities and the con taminant transformations involved, these processes are known as 'phytostimulation', 'rhizo(sphere) degradation', 'rhizosphere bioremediation', or 'plant assisted bioreme diation' (see Table 1). Distinction of bioremediation from phytostimulation is important in at least three cases. First, some hetero trophs sustainably derive carbon and energy from the degradation of organic contaminants. Second, anthropo genically synthesized organic or oxidized inorganic chemicals added to a contaminated site could temporarily free bioremediation from natural photo or chemoauto trophic synthesis long enough by cometabolism to achieve some cleanup. Third, chemoautrophs synthesiz ing biomass from inorganic compounds to provide organic carbon and energy for heterotrophs conceivably could be used in sustainable bioremediation. If any amendments and cofactors are obtained and added sus tainably, then these bioremediation processes are sustainable. The most common amendment is fertilizer, used primarily to bulk up plant biomass and thus increase microbial biomass and activity in the rhizosphere. BTEX, benzene, toluene, ethyl benzene, and xylene; DCE, dichloroethane; DDT, dichloro diphenyl trichloroethane; DNT, dinitrotoluene; HCA, hexachloroethane; HMX, octahydro 1,3,5,7 tetranitro 1,3,5,7 tetraazocine; MTBE, methyl tert butyl ether; NB, nitrobenzene; NT, nitrotoluene; PAHs, polycyclic aromatic hydrocarbons; PCBs, polychlorinated biphenyls; PCE, tetrachloroethene; PCP, pentachlorophenol; RDX, hexahydro 1,3,5 trinitro 1,3,5 triazine; TCE, trichloroethene; TNT, 2,4,6 trinitrotoluene; VC, vinyl chloride. define whether plant or microorganism management tech niques must be applied. When critical rates for microbial and botanical uptake and transformation are comparable, both techniques should be applied simultaneously for engi neering redundancy and ecological resilience. One of the most significant advances in phytoremedia tion is that green liver metabolism is much more important in waste management than early biotechnology research revealed. Sandermann first coined the term 'green liver' to convey the great similarity between plant and mammalian sequestration and metabolism. So great is the similarity that many view plant metabolism more akin to mammalian metabolism than to bacterial metabolism. In fact, many fundamental metabolic processes first evolved in early cyanobacteria and bacteria and were carried forward, sometimes without evident purpose, into higher forms of life present today, including vascular plants and mammals. But for future xenobiotic and highly complex hazardous wastes, the most sustainable applica tions may need to concentrate on use of the most highly evolved enzymatic systems available only in plants and animals. In part, bacteria versus higher forms of life have evolved different survival strategies. Microbes are present in great numbers, almost ubiquitous on this planet, usually passively mobile, more adaptable, and capable of evolving rapidly. Thus, a toxic insult will kill many microorganisms but the species will usually survive, maybe even the rigors of outer space. If the die off is extensive or long term, new protections may evolve by selection of the fittest. Plants are normally rooted in place and are much fewer in number. Thus, plants may have evolved greater numbers of metabolic proteins used to detoxify insults in place, than microorganisms evidently require for survival. Plants are different from animals in the lack of (1) an immediate flight response and (2) excretion of transfor mation products. Animals tend to excrete transformation products, whereas plants tend to accumulate some trans formation products in vacuoles or between layers of molecules in cell walls. Plant transformation products are accumulated and could be released into the environ ment upon death and lysis of plant cells.